To quantify vessel density (VD) and grey value (GV) as a measure of flow in the choriocapillaris (CC) in healthy subjects with optical coherence tomography angiography (OCTA). In this prospective, noncomparative case series, 3 mm × 3 mm OCTA images of 36 eyes of 22 healthy individuals were obtained using a swept-source instrument. VD and GV levels were calculated on CC en face slabs in the central 1-mm (subfoveal field) and surrounding 2.5-mm parafoveal ring. VD was calculated as a ratio of vessel area over nonvessel area following image binarization. GV was computed as the mean, un-normalized greyscale intensity value for all pixels in the region of interest. For each eye, the procedure was repeated 1 minute to 2 minutes later and intersession repeatability was analyzed. The choroidal thickness (CT) was automatically measured in the subfoveal and parafoveal regions and compared to VD and GV values. The VD ratio and GV was lower in the subfoveal field than in the parafoveal four sectors. The intersession intraclass correlation coefficients were high for both VD and GV measurements. There was no correlation observed between CT and VD or GV. Quantitative metrics can be obtained from CC OCTA en face images. These values show moderate to good intersession repeatability. These normative data may be of value as a reference of comparison in future studies of eyes with disease. The noninvasive technique of optical coherence tomography angiography (OCTA) provides additional, clinically relevant insight into the vascular structures of the eye. OCTA shows vascular changes in different retinal, choroidal, and optic nerve diseases.7–10 The acquired signal is generated from repeated B-scans obtained at the same position of the retina and choroid. The angiography projection slab is generated by displaying the signal as a gray scale image. Accordingly, the aim of this study was to analyze the features of the CC quantitatively in healthy individuals using swept-source OCTA and to measure its repeatability. This prospective, noncomparative case series was approved by the Institutional Ethics Committee of the University of California Los Angeles and conducted according to the tenets of the Declaration of Helsinki. The study was carried out in accordance with Health Insurance Portability and Accountability Act regulations. All subjects signed written informed consent prior to participating in the study. Healthy individuals older than 18 years with no previous history of ophthalmologic or systemic diseases were included. Subjects were required to have a normal ocular examination and a normal structural OCT of the macula. Those with a refractive error greater than 2.5 diopters or a history of any ocular surgical intervention (including refractive surgery) were excluded. All OCTA scans were performed by a single experienced examiner (MA) using a swept-source OCT (SS-OCT) device (DRI OCT Triton; Topcon, Tokyo, Japan) with a central wavelength of 1,050 nm, an acquisition speed of 100,000 A-scans per second, and an axial and transverse resolution of 7 μm and 20 μm in tissue. SS-OCT technology uses longer wavelength infrared light with less sensitivity roll-off with depth compared to conventional spectral-domain OCT, which allows for deeper penetration into tissue and better imaging of the CC. Scans were taken from 3 mm × 3 mm cubes, with each cube consisting of 320 clusters of four repeated B-scans centered on the fovea. To investigate repeatability of the measurements, two sets of scans were obtained for each subject, 1 minute to 2 minutes apart. En face images were generated from the CC based on automated layer segmentation performed by the OCT instrument software (IMAGEnet 6 V.1.14.8538). The automated segmentation defines the en face slab for the CC to extend from Bruch's membrane to 10 μm below. All images were reviewed to confirm accurate segmentation by the automated instrument software. No manual adjustment was deemed necessary. For choroidal thickness (CT) measurements, a volume OCT was captured with the same SS-OCT device using wide field 12 mm × 9 mm raster scan protocol with the scan centered on the posterior pole. The 12 mm × 9 mm scan is composed of 256 B-scans, each comprising 512 A-scans with a total acquisition time of 1.2 seconds. A 3.4 mm diameter circle was used to automatically generate the thickness of the choroid. Quantitative analysis was performed using the publicly available ImageJ software (National Institutes of Health, Bethesda, MD).26 The en face slab of the CC was used for quantitative analysis. A region of interest (ROI) was established as a 2.5-mm diameter circle centered on the fovea (center of the OCTA en face image). We chose 2.5 mm as opposed to 3 mm (the maximum possible size) since we planned to align data from repeated scans; if there was a slight displacement of the repeated image relative to the first image, the ROI would extend past the border of the scanned area for at least one of the images. This 2.5-mm circle was divided into a central 1-mm subfoveal field and a surrounding parafoveal ring. The parafoveal ring was further subdivided into nasal (N), superior (S), temporal (T), and inferior (I) sectors. Figure 1 shows the OCTA image of the CC and the schematic ROI depicting the subfoveal field and the parafoveal sectors. Choriocapillaris en face projection slab with projection of the region of interest (ROI). The ROI consists of a circle with 2.5-mm diameter circle, which was further subdivided into a subfoveal field (1 mm in diameter) centered at the fovea and a circle with a 2.5-mm diameter for the remaining area. The parafoveal ring was divided to nasal, superior, temporal, and inferior sectors. The CC en face image was analyzed in two ways. First, as in our previous reports of the retinal circulation, vessel density (VD) was expressed as a ratio by taking the total vessel area divided by the total area of the analyzed region.27 For this measurement, we used a binarized image with intensity thresholding with Otsu's thresholding method as implemented in ImageJ. Otsu's method assumes that the image contains two classes of pixels following a bimodal distribution. It calculates optimum threshold by minimizing intraclass variance and maximizing interclass variance.26 For the second assessment, we calculated the mean grey value (GV) as a measure for the flow in the CC, using the automated tool for GV measurement as implemented in ImageJ to quantify the flow information detected as motion. The GV represents the brightness of a pixel, which is an indicator of flow area in an OCTA image. The minimum and maximum grey levels are 0 and 255, respectively. The mean GV is the sum of the grey levels of all the pixels in a selected area divided by the number of pixels. Of note, we did not perform any normalization of the OCTA images for the GV measurements. To calculate the repeatability of the repeated scans, the images of the CC of the two sessions were registered to each other. For this purpose, the two superficial retinal layers were registered to each other using vascular bifurcation in the superficial plexus as landmark in order to align the two CC images for accurate measurements — in other words, to ensure that the ROIs were at the same location. The VD and GV measurements of the CC were repeated for the images from the second session using the same protocol. Figure 2 illustrates the registration and alignment of the images from the two different sessions. Registration and alignment of the choriocapillaris (CC) to the corresponding superficial retinal layer. (A, B) The en face projection slab of the superficial retinal layer from the two sessions. (C) The original image from the first session and (D) registration of the superficial retinal layer according to vessel bifurcation as landmark correspondence with red, green, and yellow dots. (E) The original en face projection slab of the CC from the first session. (F) The aligned CC slab from the second session. White arrows show the direction and area of adjustment of the second session according to the registration of the vessels. For the CT analysis, a choroidal map was automatically generated with numeric averages of the thickness measurements for the nine map sectors as defined by the Early Treatment Diabetic Retinopathy Study (ETDRS). Manual adjustment of the position of the ETDRS grid was performed if necessary. To correlate with our choroidal VD measurements, we used the central 1-mm diameter circle for the subfoveal field and the four sectors of the middle ring. All statistical analyses were performed using SPSS software version 21 (SPSS, Chicago, IL). Paired samples (VD and GV for the different ROIs) were tested for normal distribution using the Shapiro-Wilk test. Analysis of variance was used to test equal variances for differences between the means. The Bonferroni correction was used to obtain P values. Pearson correlation coefficient was used to test the correlation between CT with VD and GV. The intraclass correlation coefficient was used to analyze repeatability. A P value of < .05 was considered significant. Thirty-six eyes of 22 healthy individuals were included in this study. The mean age was 37.5 years ± 8.7 years (range: 28 years to 59 years); 10 of the individuals were male and 12 were female. Morphologically, as previously described, the CC appeared to have a uniform dense and homogenous appearance with variations in grey scale intensity. The distribution of the measured values and the standard deviation for the cohort are shown in Figure 3. 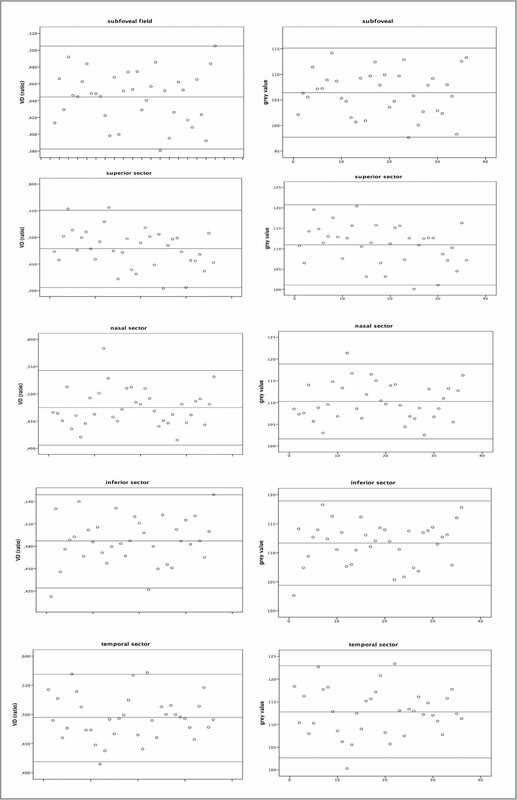 Left column shows the distribution of the measured vessel density ratio (Y axis) for each patient (X axis) according to the region of interest. The middle line represents the mean of all lines, and upper and lower lines represent the standard deviation. Right column represents the grey value. The VD was 0.444 ± 0.031 in the subfoveal field, 0.474 ± 0.034, 0.478 ± 0.036, 0.494 ± 0.037, and 0.487 ± 0.031 in the N, S, T, and I sectors, respectively (Figure 4A; Table 1). The GV was 106.42 ± 4.351 in the subfoveal field, 110.26 ± 4.305, 110.907 ± 4.910, 112.787 ± 5.077, and 111.67 ± 3.642 in the N, S, T, and I sectors, respectively (Figure 4B; Table 2). Vessel density ratio and grey value (GV). 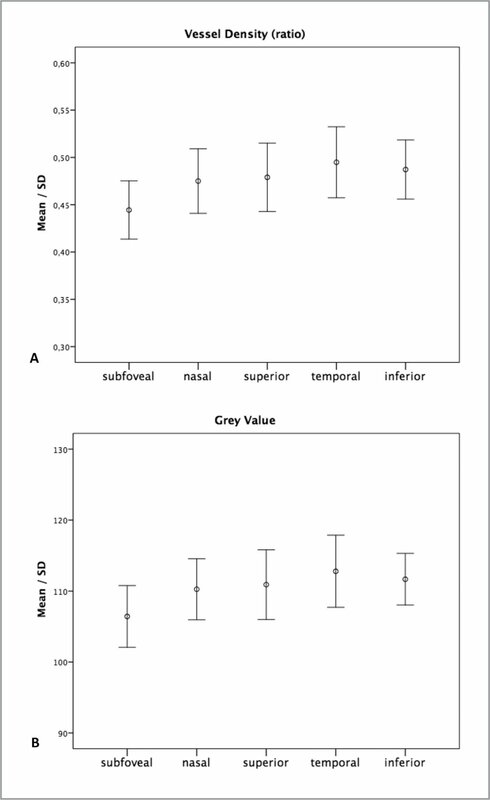 (A) The mean standard deviation (SD) of the vessel density ratio in the subfoveal, nasal, superior, temporal, and inferior sectors. (B) The SD of the GV in the corresponding sectors of the region of interest. Error bars represent the 95% confidence interval. The VD and GV in the subfoveal field were statistically significantly lower than in each parafoveal sector (both P < .001). The intersession repeatability was moderate to high for all VD measurements (0.79 to 0.92); however, it was somewhat lower for GV measurements (0.69 to 0.89). 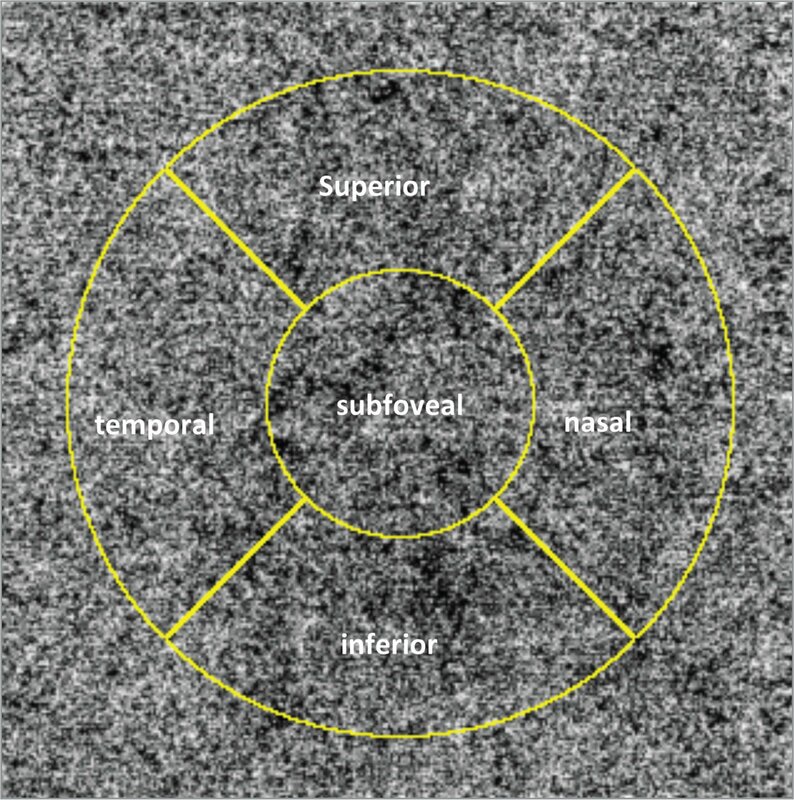 The CT in the subfoveal field was 276.07 μm ± 87.168 μm compared to 270.96 μm ± 71.1 μm in the parafoveal ring. The difference was not statistically significant (P > .05). No correlation was observed between the VD and GV measurements and the CT values in the subfoveal and parafoveal regions (all P > .05). In contrast to previous dye-based angiography studies, which suggested that each CC lobule was an independent unit with no anastomoses with adjoining lobules, our findings would appear more compatible with the histologic vessel cast-preparations of the CC, which show a markedly interwoven and interconnected network of sinusoidal spaces.3,28,30 However, the resolution limit of OCTA is higher than the resolution needed to visualize the flow in individual choriocapillary vessels. 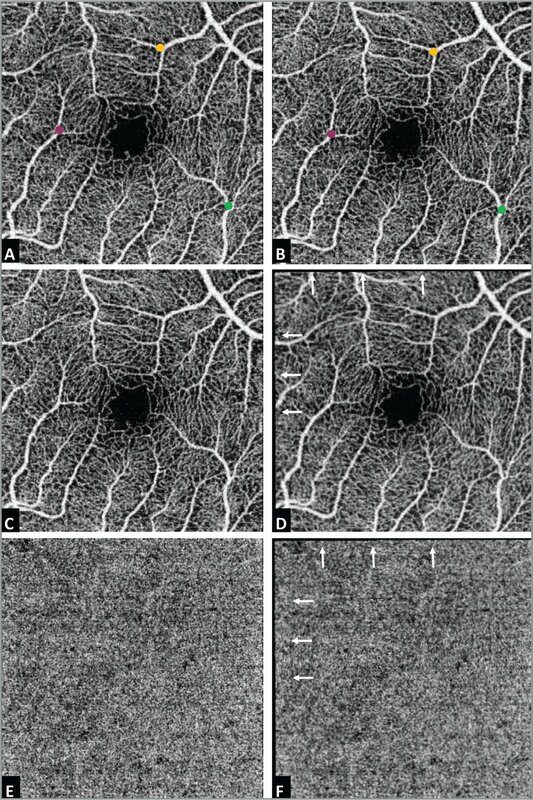 Spaide analyzed images of the CC from the central macula obtained with an RTVue XR Avanti (Optovue, Fremont, CA) instrument.15 He reported that the pattern of flow voids formed a scale invariant pattern in the CC, starting with a size much smaller than a choroidal lobule, and with significant alterations in those eyes with pseudodrusen or those with late age-related macular degeneration in the fellow eye. He did not quantify the VD. Wang et al. did quantify VD in the CC layer in healthy eyes.25 They arbitrarily chose 57 areas distributed within the 1-mm diameter subfoveal circle and another 155 areas located in the surrounding 3-mm ring-like region to measure the mean CC vessel diameter and pixel density. Similar to our findings, the VD of the CC was 44.4% ± 3.3% in the central 1-mm area and 44.5% ± 2.7% in the pericentral region. We reported another parameter for the CC slab, GV, and found that it follows the same behavior as VD, with a lower value for the central subfoveal area compared to surrounding regions. Our study used a SS-OCTA with a light source centered at 1,050 nm, which can penetrate tissues to a greater extent with less sensitivity roll-off with depth. This could be an advantage for evaluating the microcirculation of the CC. Our study has limitations that should be considered when assessing our findings. First, our sample size is relatively small and mostly a younger population, which does not allow a comparison of the CC values with age. Thus, our results are likely not applicable to older patients; and Spaide did suggest there may be more flow voids in the CC in older individuals. Second, we only used information from one OCTA instrument and one standard, manufacturer-provided processing method. Each OCTA device uses its own proprietary acquisition and processing techniques, which vary with regard to thresholding (to display flow versus no-flow) and to the scheme for removal of projection artifact. Thus, our findings are almost certainly not applicable to other instruments, and possibly not even to future enhanced processing algorithms for the present device. Despite the heavy manufacturer “processing” of OCTA data, it is still interesting that in an individual subject, we observed good repeatability. Third, we did not apply any normalization (ie, correction for overall signal intensity, which may be affected by image quality, etc.) for the GV. It is unclear whether some type of normalization scheme, as we have successfully applied to structural OCT,31 may have yielded even better intersession agreement. In addition, although the goal in developing a normative database is to provide a reference for comparison with diseased eyes, other abnormalities in diseased eyes (such as loss of signal due to thickened retina) may confound CC assessments and comparisons to normative data. In summary, our study provides insight regarding the repeatability of two quantitative metrics for evaluating the CC in normal individuals. These findings may provide a useful reference or starting point for assessing variations in the CC in normal eyes, changes over time, and possibly CC alterations in the setting of disease. Wise GN, Dollery CT, Henkind B. The Retinal Circulation. New York, NY: Harper & Row; 1971. Levin LA, Kaufman PL. Adler's Physiology of the Eye: Clinical Application. Edinburgh, NY: Saunders/Elsevier; 2011. Flower RW. Extraction of choriocapillaris hemodynamic data from ICG fluorescence angiograms. Invest Ophthalmol Vis Sci. 1993;34:2720–2729. Puche N, Hera R, Terrada C, Souied EH. Persistent placoid maculopathy imaged by optical coherence tomography angiography. Retin Cases Brief Rep. 2016;10(4):297–301. From Doheny Eye Institute, Doheny Image Reading Center, Los Angeles (MAS, KGF, AU, PPL, SRS); the Department of Ophthalmology, David Geffen School of Medicine at UCLA, Los Angeles (MAS, KGF, AU, SRS); the Eye Research Center and Eye Department, Rassoul Akram Hospital, Iran University of Medical Sciences, Tehran, Iran (KGF); and the Department of Ophthalmology, University of Bonn, Bonn, Germany (MP). Dr. Sadda is a consultant for Carl Zeiss Meditec, Optos, Allergan, Genentech, Alcon, Novartis, and Roche. He receives research funding from Carl Zeiss Meditec, Optos, Allergan, and Genentech and receives honoraria from Carl Zeiss Meditec, Optos, and Allergan. The remaining authors report no relevant financial disclosures. Address correspondence to SriniVas R. Sadda, MD, Doheny Eye Institute, 1450 San Pablo Street, Los Angeles, CA 90033; email: ssadda@doheny.org.